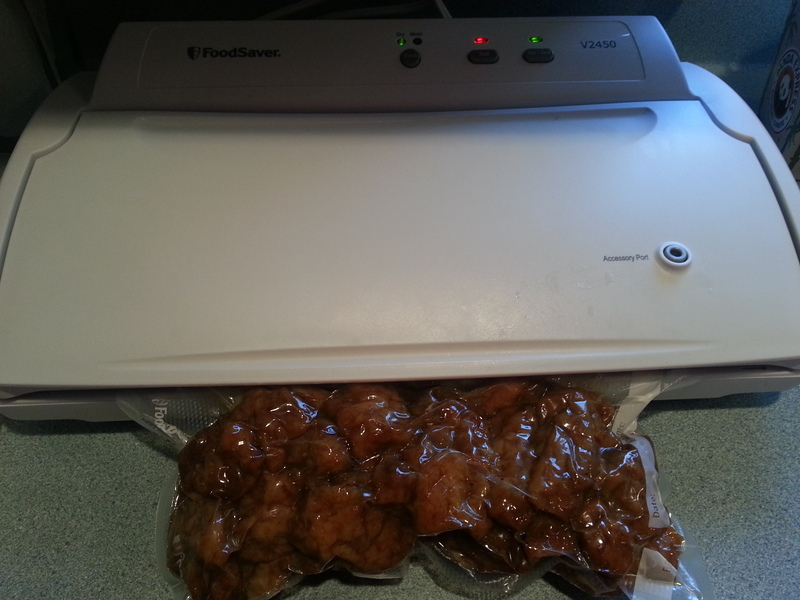 Vacuum sealers are machines that are marketed for vacuum packaging food at home. There are many different models available but these machines are intended to extend the storage time of refrigerated foods, dried foods and frozen foods. I bought one to use with freezing meats and leftovers to keep the quality better for a longer period of time. The benefit of removing the air before sealing is the increased storage time of refrigerated, dried and frozen foods. If the air is not removed, oxygen can cause fats to develop rancid flavors and change the food’s color, texture and flavor. Vacuum seal bags are designed to help keep meat and other foods fresh in the freezer by preventing the loss of moisture and the development of freezer burn. 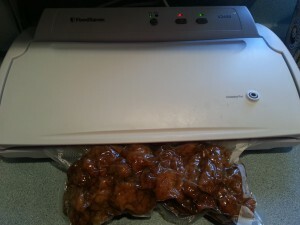 What vacuum sealers do not do is make a product that needs to be refrigerated shelf stable. The removal of oxygen from a food package doesn’t eliminate all bacterial growth; it just changes the type of growth that can occur. Temperature control is critical for safe vacuum-storage. If foods that require refrigeration are vacuum sealed then left at room temperature, there is a risk of harmful bacteria growing and causing illness. 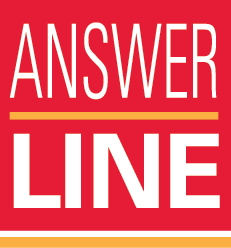 This also means that frozen items that are vacuum sealed should be thawed in the refrigerator, NEVER on the counter. Vacuum sealing food does not replace the need to pressure can or water bath home canned foods that are stored at room temperature. Keep vacuum sealed perishable items that need refrigeration (fresh produce, meat and fish, semi-dried foods, and moist bakery items), in the refrigerator or freezer. Use a vacuum sealer to extend the shelf life of properly dried nuts, fruits and vegetables and meat jerky. The removal of the oxygen will help these foods continue to taste fresh. Wash your hands before and during the sealing process. Keep utensils, cutting boards and counters clean. Don’t allow the food you are vacuum sealing to be out of the refrigerator before or after you seal it. Remember to always follow safe food handling practices and enjoy the benefits of vacuum sealing foods. I’ve used vacuum sealers before and i don’t like it every time i used mine it left the food with a plastic smell and taste i don’t know if my sealer is broken or not, but from my experience i don’t recommend them at all.